I didn't realize it had been so long since my last post! I have done quite a bit of sewing since Christmas, but it's been less sharable, like crib sheets, changing pad covers, and quilt top piecing. I'll share some of them once they are finished. I have not sewn clothes for the girls since their Christmas dresses, which were sadly so Christmasy that they have been packed up for a few months. I'm working on new springy dresses for both of them for Easter. Lately, I've been watching a lot of Instagram accounts of gals who sew clothing for themselves. My favorite to follow is Meg from the Cookin' & Craftin' blog. She recently sewed a couple different versions of the Style Arc Adeline dress for herself and a friend, and they looked so good! I had never sewn with a Style Arc pattern before, but I've been eyeing them for the past year. Meg shared that Amazon has a few of the patterns in printed form, which helped me decide to give them a try! (I still hate printing, trimming, and taping 20 pages of printer paper together and hoping the scale is correct.) I ordered the Adeline and the Olivia patterns to start with. 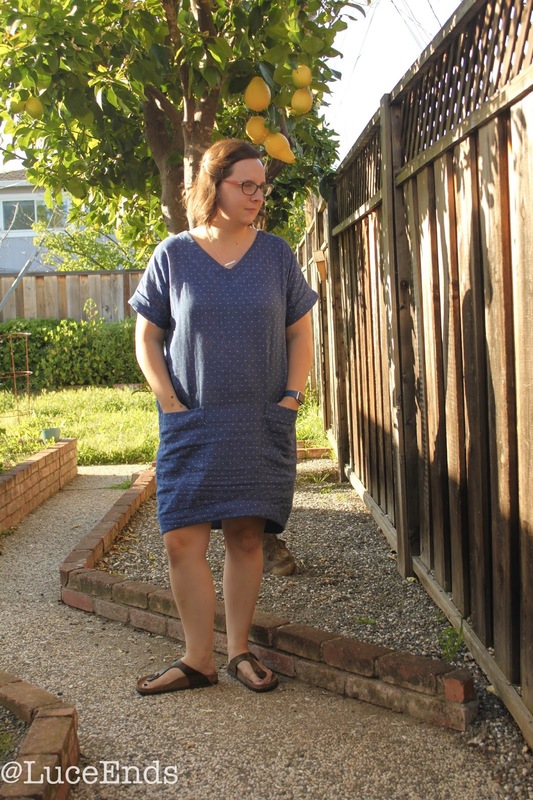 I began with Adeline, and made a muslin in the size my measurements fit closest with. I knew I needed the hips to fit, and that the bust is the most important measurement to match. After several self-sewing projects that I greatly disliked and spent days on last year, this one fit surprisingly well without any modifications to the muslin! Thank goodness there were no darts. My husband helped me get my serger re-threaded and working appropriately, and I read a little about its tension and practiced on some scraps. I made the hard decision to use some beautifully soft double gauze that has a denim look that I've been hoarding for at least three years. I originally bought it in Ballard, before Dry Good Design moved, to make a dress that I could never see myself wearing. 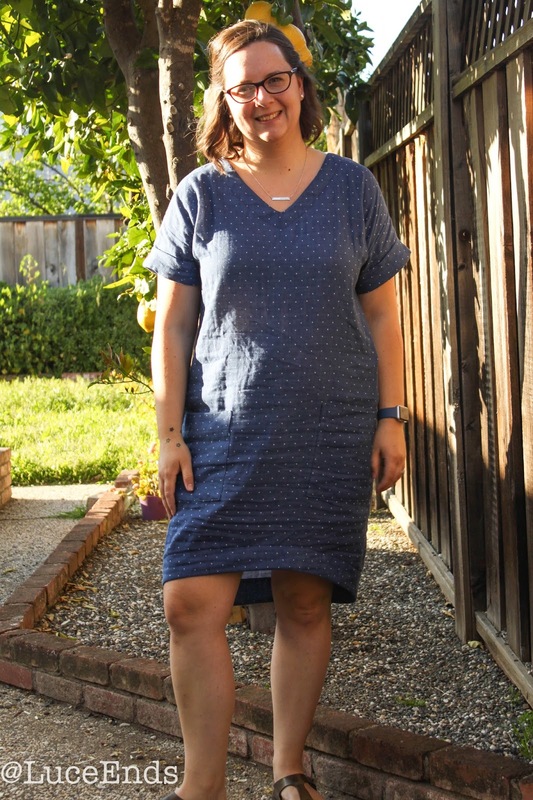 This dress was so quick and fun to sew! I used the serger for the side and shoulder seams, and my sewing machine for the facings and topstitching. I did end up shortening the length and the lengthen line by an inch and a half, which I'm glad I did. I also cut about half the sleeve length off because I didn't like the way they made the dress look when they were super baggy. Although it has very minimal directions, the pattern went together exactly as indicated. I'm thankful I've sewn so much with Oliver + S patterns for kids because it helped me know where to use skills not included in these instructions (finishing the edges of the facings, tracing topstitching lines on top of the dress). Once I can decide on the fabric, I'm certain I will make another one. Fabric: Organic Cotton Double Gauze 56" - I think this is it, and it is fantastic! 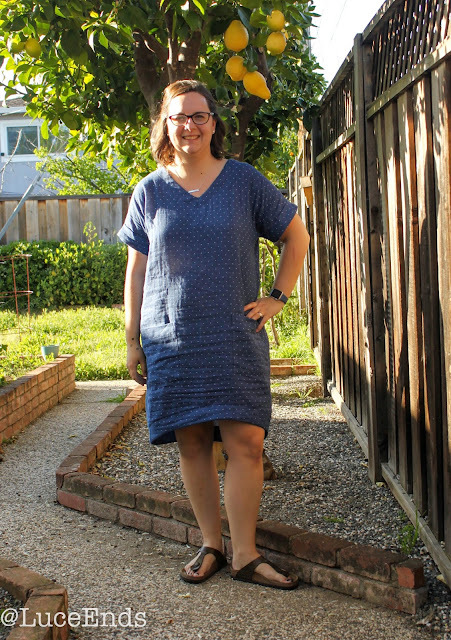 Changes: I reduced the length by 1.5" and shortened the sleeves by about half the length. It's really cute on you; I'm glad you went for it with that fabric! This looks great!!! I love that fabric, it looks beautiful and it must be lovely to wear. I agree with you - Meg is the great selfish-sewing enabler! Her blog is so fun and inspiring!